The Gluten Free Photographer: Mmmmmm.... Doughnuts! I don't know about you, but the problem with me is that I always want to eat dessert not long before bedtime. 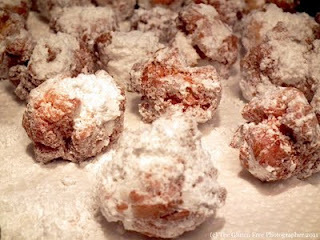 My favourite 'midnight snack' is my take on French Market Doughnuts, also known as Beignets. 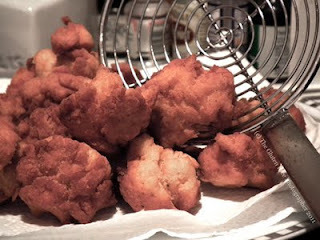 In fairness to the excellence of the original Beignet, my version is quite different as my recipe doesn't allow the dough to prove for around an hour as a typical recipe of this nature would call for and I do not roll out the dough and then cut it into pieces for frying. This comes down to impatience. I want my doughnuts and I want them now! As I like to bake these at night, my pictures are quite dark as they are taken in artificial light on dark work tops - so picture quality is compromised somewhat...! See my Cups For Cooking page for conversions. - Get a big heavy bottomed pot and pour in enough vegetable oil until it reaches half way up the pot and leave aside. If you have your own deep fat fryer, have that cleaned and ready with fresh oil. - Scald the milk in a separate pot. Pour the scalded milk into a large mixing bowl and leave to cool - this is so that when you add the egg, it doesn't cook. - Mix the dry yeast, warm water and sugar in a small bowl and leave aside for around 5 minutes to allow the yeast to activate. 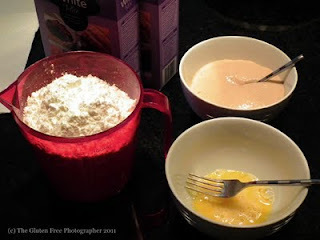 - Taking the large mixing bowl that has the cooled scalded milk (can be warm to room temperature), add the salt, oil, sugar, nutmeg, egg and the yeast mix (which should have expanded and appear foamy by now), and mix until combined. - Add your flour gradually, one cup at a time while mixing until all 3 1/2 cups have been added and combined. I use a Kitchenaid with a dough hook attachment to make my doughnuts. - Now make sure the dough is not too wet. It should have the consistency of play-doh (ie. no longer sticky). If it's still too wet to work with, add the remainder 1/2 cup of flour and that should sort out the consistency. - Put the pot that has the oil in it on the hob and heat up the oil on a medium-high heat. 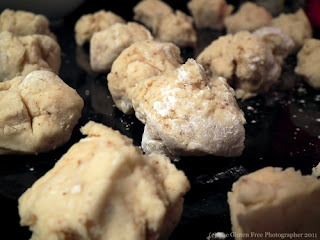 - Divide the dough in the mixing bowl into small pieces around half the size of a golf ball. Don't make them too big or they won't cook through. Can make between 50 - 60 doughnuts. 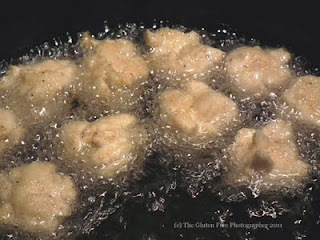 - Test the oil in the pot by dropping a small piece of dough into it. If the dough starts immediately to rise to the surface and bubble, your oil is ready. If it sinks to the bottom of the pot, you still have to wait. Make sure your oil never smokes, if you start seeing smoke from your oil, it's too hot and is at risk of burning, remove it from the heat immediately and allow it to cool down. - Once up to heat, place around ten pieces of your mix into the oil and let them cook until they start to turn golden brown on one side. Turn the heat of your oil down to medium once you start frying. - When your doughnuts have browned on one side, using a large metal slotted spoon turn them over to the other side and allow to brown. - Once fully browned, using your slotted spoon, place them gently on a kitchen towel lined plate. 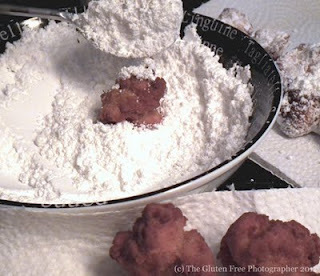 - Then roll them in a bowl of powdered sugar until fully coated and leave them aside on a piece of kitchen towel. 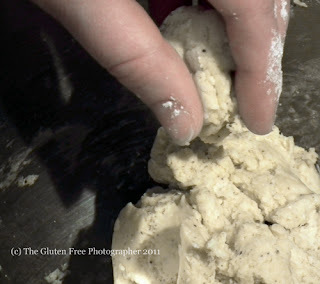 - Do the last 4 steps until all the dough has been used. - Place the doughnuts in a large enough bowl that can hold them all, make sure it's lined with kitchen towels and enjoy!